I've a few questions which may seem a bit irritating for persons under 16 (18?) or with a particular view/belief on things. I'm talking about hunting questions with explicit content. Things like "how to quarter a moose?" etc. Questions which have explicit pictures and/or videos in itself or its answers. Should we somehow tag them? Like "How to quarter a moose? [EXPLICIT]" or something? How do we handle pictures etc.? Is the spoiler mark down1) enough? I don't think an explicit is needed. 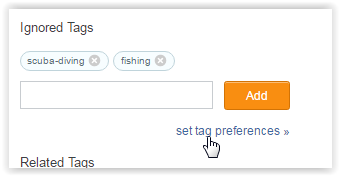 Anyone who doesn't want to see hunting (or any other tag) can edit their favourites to ignore topics. Then they don't appear at all! No, please don't. This site includes support for a lot of sportsman's activities so things can get slimy and squishy on occasion. There's no need to be overly gratuitous, but don't tell a hunter to cover their activities in hushed whispers until they're packaged on a Styrofoam tray wrapped in Saran Wrap. It's laughable… and embarrassing. I dread the day when TGO turns into a safe space where everyone must take care not to offend in exchange for being allowed on the site. This is hardly the first case of something gruesome and gross being on TGO. The only reason we are even having this conversation is because the question was about hunting. That tells us a lot about how accepting (or not) our community is and, IMO - That is what we should be concerned about. So let's call a duck a duck: What we are actually asking is "Should we censor hunters because it offends the sensibilities of some users." My answer is a firm and resounding NO. Of course we should not censor anyone. Nobody should get banned for posting gruesome stuff (when relevant). But where is the harm in providing this content in a way that every user can easily choose whether he/she wants to see it or not? All I am asking is to remove this content from direct line of sight: Is it really censorship if an image is only linked to in a post instead of directly inserted into the post? And again what we really are doing here is making a mountain out of a molehill. We do not really have a general problem with this on TGO and can find a way to deal with this when it comes up. In general I do agree with the argument, that in the outdoors and specifically in hunting things get messy/gruesome/bloody/... and it should be possible to discuss and where relevant show a picture. However one also needs to accept that what is acceptable to someone might be highly objectionable to someone else. We want to target the broadest audience possible, so the gruesome part must be avoidable. This means: Keeping the tone in the title down, as this is what everyone, whether as user or from a search engine reads first. If we do need to hide a possibly gruesome image, we can either use the Spoiler tag, or if we really don't want it on the site, just have it as a link, and annotate with "this links to particularly gory pic - don't click unless you want to see it." This is already used to great effect on a few Stack Exchange sites (Movies, SciFi etc) where it can be used to cover up anything that should remain hidden until the reader decides to uncover it. I would suggest to always link if you think your picture is not appropriate for all audiences. Hovering over accidentally happens way too easily. And to be honest: It does not hurt the question if the image is external. Very often we are anyway infringing on copyright issues when uploading images to imgur and displaying them here directly. In the general text after a possible short reminder that the following might be gruesome, it is obviously possible to be as explicit and detailed as possible, as long as it serves the question. Telling people to hide tags is not an option for two reasons: First due to external visitors and second because it absolutely is possible and valid/acceptable to be interested in e.g. hunting but not wanting to see anything explicit. Last comment: The question that spawned this discussion is exceptional and OddDear already stated that it was purposely tailored to probe for reactions. I still do not understand its value exceeding getting an explanation for one specific phenomenon. We had other questions that were somewhat gruesome, but they had in my opinion more substance and thus the gruesomness was better accepted. I still do not think this issue is or will be crucial/often encountered in this community. Be conservative in titles: Keep it factual and don't go into detail/be descriptive - that belongs to the question body. Use gruesome pictures if it serves the question, but only add a link to the gruesome image to your answer if in doubt about its appropriateness (this site is public). Spoiler markdown is essentially useless: Hovering over accidentally happens too quickly. So, I've posted the first truly explicit question here: What might cause a massive blood stream from a lethally hit moose's mouth? I've to admit that I went all-in :) The reactions so far are pretty mixed. Most of the people seem to take it just as another question but there are also comments which thank me for warnings on the content. However, one comment made me really sad. It's from a very valuable user of the community and she absolutely disliked the question. OddDeer, thanks for the attempt at hiding the graphic content, so if people are careful, they don't have to see it. I've downvoted and flagged because the whole question is full of language and graphic descriptions not fit for the average public viewer. I respect hunters. I also believe in the SE model, that the community should evaluate the content. However, If the consensus is that this question in this form is acceptable on the site, I won't be returning. 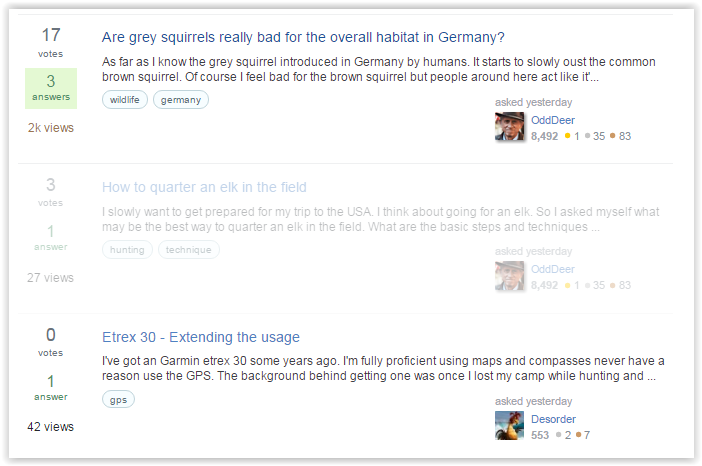 Core problem: Users may want to see hunting questions (curiosity whatever) but not such which contain material of suffering animals. They can't just ignore the hunting tag overall. So the provided features are not sufficient for them. 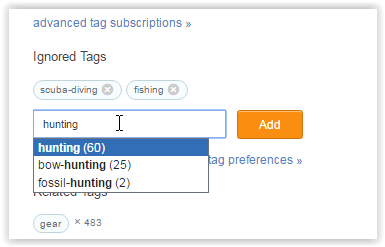 My solution: Creating a tag explicit and then warn people using the hunting tag that their question may need to get tagged with it. People are able to just ignore the tag explicit and still can read the other hunting questions. A truly working feature could be a mark-down called explicit. Explicit does basically the same as the in the question mentioned spoiler mark-down but hides the content completely for anonymous users. Also, if a single piece of explicit mark-down is used, the question automatically gets tagged with explicit. Hidden explicit content - please log in to see the complete question. And as already said, the asked question automatically gets explicit. I've requested the feature on Meta.SE. Its an outdoor site, there might be hunters and they might ask hunting questions, what's acceptable or not is to be decided by the community, however many users are non-hunters and I suspect some are vegetarian too. They can be tolerant of hunting questions and in return hunters can be less explicit... (Beside the fact that is the attitude of some hunters that causes this kind of discussions and there’s no need to bring them audience from SE) I find the moose question is unnecessary: comments in the video tell you what happened, an hunter should know what’s going on anyways, there is absolutely no need for explicit wording, pictures, links to videos that can be easily found if someone wants to. As for preparing the meat that can be shown with drawings that are way less graphic. If its a community for everybody I think that a bit of moderation (as avoiding excess) should help in respecting everybody's point of view. It would make for a pretty sad site if everybody went posting pictures of nasty shark bites, multiple exposed fractures or worse, and other pretty graphic stuff you can come across in the outdoors. Basically there is no need to be that explicit in any question, if worded properly without the graphic pictures, videos etc the whole issue of hiding a question would not exist in first place. There is also a question about Everest corpses and noone felt the need to attach pictures of them.